About two million Brits live, work, study or are retired in other EU countries. Over 800,000 of them are estimated to reside in Spain alone; over one million if you include those who sojourn there for just part of each year. The numbers might now be higher, as the latest estimates* were published in 2010. In addition, many tens of thousands of British own second homes right across the European Union – over 140,000 estimated to be in Spain and Italy. Understandably, these British expatriates are concerned about what will happen to them, and their homes abroad, if Britain leaves the European Union. ‘Expat Forums’ are replete with anxious postings about just this subject. This month Nigel Farage, leader of the anti-EU UKIP party, was interviewed by Talk Radio Europe, which is based in Spain and broadcasts in English to British expats living there. All Britons, together with all other EU citizens, have a right to live, work, study or retire in any other country of the European Union, as a direct benefit of EU membership. But Mr Farage not only wants Britain to leave the European Union, he told Talk Radio Europe he also wants to see 'Europe out of the European Union' - in other words, the complete disintegration of the European Single Market. what will happen to them if the UK exits the EU? This implies that, if UKIP have their way, British expats could stay in Spain, but the Polish expats, and other EU migrants, could not stay in Britain. Don't we call that 'double standards'? The Polish, for example, have also made a huge contribution to the British economy; they are mostly fully employed; very few are pensioned or ill or claiming benefits, and there are fewer Polish in Britain than British in Spain. Yes, of course a 'reciprocal deal' could be made, but we already have a 'reciprocal deal' through the European Union. Why leave the EU only to have to re-negotiate similar 'reciprocal deals' with other countries in Europe, and the world, all over again? There were other claims made by Mr Farage during his interview, the veracity of which demand closer scrutiny and wider debate. See below my challenges of just four of them. I welcome comments and feedback, especially from British expats with a view on whether they, and their homeland, should stay in the European Union. The percentage of British laws originating from the European Union was estimated to be almost 7% for primary legislation, and 14% for secondary legislation, in a report* by The House of Commons Library, a non-partisan organisation. (*Calculated between 1997 and 2009). Calculating the amount and impact of UK legislation coming from the EU is complicated and various studies have used different methods to reach different conclusions. The UK government has initiated a major 'Review of the balance of competences' which will be an audit of what the EU does and how it impacts on the UK. It should be completed towards the end of 2014. The European Parliament is democratically elected and decides nearly all EU laws, and has the democratic power to dismiss the entire Commission of the European Union. The Parliament is made up of 754 members, elected every five years by the citizens of all 27 member countries of the European Union. It’s one of the world’s largest democratic assemblies, representing over 500 million citizens. The Parliament has elected representatives from all the main political parties in Europe - conservatives, socialists, liberals, greens, variants of the extreme left and extreme right, as well as anti-European parties, such as UKIP. The elections take place in each country on identical democratic grounds, requiring equality of sexes and secret ballots. The voting age is 18, except in Austria where it is 16. The seats are shared proportionately to the population of each member country. Members of the European Parliament discuss and decide vital issues aimed to improve the lives of all citizens of the EU, including consumer protection, the environment, transport, culture, education and health. Some assert that the European Parliament makes its decisions in secret, but in fact it’s one of the world’s most open democracies. Parliamentary sessions and committee meetings are televised on the internet live every day on Europarl ITV. In addition, EU decisions, guides and laws are openly accessible in every EU language. Why don’t we hear more about EU Parliamentary democracy at work? One reason is that the discussions, actions and decisions of the EU Parliament are rarely reported by the UK media, and often what’s reported is, to put it bluntly, completely false. That’s maybe not surprising, when one considers the number of UK newspapers that appear to be against UK membership of the European Union: the Daily Express (primarily), the Daily Mail, The Sun, Telegraph and The Times. That’s a combined readership of almost 20 millions, by far the majority of British newspaper readers, and double the circulation of all the other national daily UK newspapers put together. In concert with the European Parliament, EU laws are decided by The Council of the European Union, where each member state is represented by their government ministers. This is considered a democratic process, as all governments across the EU are democratically elected, with their ministers acting for us at an international level in their elected capacity as our representatives. It’s true that the meetings of the Council are held in private, but their decisions are made public. The European Union is a democracy of nations, and so has to be looked at differently to individual countries. No statespeoples are forced into membership of the EU, exit is possible, and every state has a right to veto new treaty rules. It’s true that the European Union, like all nation states, is an imperfect democracy, but it has evolved, grown and matured since its inception. Over the years, considerably more powers have devolved to the European Parliament, making it more democratic. This process should continue, but only countries who are members of the EU will be able to influence and decide how this goes. EU laws help to create a level playing field for trade, making business across Europe simpler, less expensive and with decreased bureaucracy, helping to achieve greater profitability. This isn't just beneficial for EU members. Non-EU country Norway has chosen to adopt all EU single market laws, and Switzerland most of them, because it allows easier access to the lucrative EU market. Similarly, China has adopted many EU standards and regulations to facilitate trade with Europe, it's biggest export market next to the USA. Democratically decided EU laws have benefitted its citizens, and many of these laws could only have been achieved at a trans-European level, with the combined power, leverage and sweep of nations working and acting together. For example, because of an EU single market law, 140 million citizens have seen the price of international mobile phone calls fall by 75%, after the EU banned mobile phone companies from charging four times the actual cost of the call. Such a law could never have worked if passed by a single national parliament. Passengers who were refunded for cancelled flights after the eruption of the Icelandic volcano can also thank EU legislation. Again, such a law passed by a single European state would not have been effective; it needed the power of the European Union to make the law stick. In addition, EU law has ensured that medicines across the Union are amongst the safest in the world, with strict licensing laws covering all drug companies, which could not have been so widely or effectively achieved if a single country had tried similar legislation on its own. It’s too easy to blame longer waiting times at hospital A&E departments on increased populations (i.e. more immigrants, which Mr Farage mostly means when he complains of ‘increased populations’). However, the reasons behind the current A&E crisis are more complicated, and no serious research or credible commentary has proved or blamed increased immigrant population for long waiting times. Research by the Nuffield Trust, for example, demonstrated that immigrants from other EU countries are mostly young, fit and less likely to be ill or to have started a family. Subsequently they make considerably lower use of our health service, costing a smaller amount proportionally to the NHS than Britons. Furthermore, many Polish immigrants prefer to pay to visit private Polish health clinics than use the NHS. Since 2007, such private clinics have mushroomed throughout the UK, with at least 20 in London. Another study by the Nuffield Trust found that up to 40% of the increased use of Accident and Emergency Departments come from the over-85s, who are 10 times more likely to end up in A&E than people in their 20s, 30s and 40s (the age group of most immigrants). The population of elderly in the UK is rapidly increasing, which is not the fault of immigration, but a measure of success of living in a modern rich economy. Life expectancy is rising, which ironically is partly why we need more immigrants – as we don’t have enough young to care for and support our old. According to the Foundation Trust Network, up to 30% of people attending A&E departments were only there because, 'patients can’t get the GP appointments they need', especially out of hours. That’s also hardly the fault of immigrants. Another major problem, claims FTN, is that the government is 'only paying hospitals 30% of the cost of treating some admitted A&E patients'. It can also be argued that immigrants to the UK put far more into the NHS than they take out. Around 30% of NHS doctors and 40% of nurses were born overseas. We rely on these foreign born professionals. Without them, the NHS would likely come to a standstill. Yes, surprise surprise, it’s true: 4% of the populations of Romania and Bulgaria equals 1 million (well, 1.15 million to be precise.) But just because 4% equals one million doesn't mean that such numbers of Romanians and Bulgarians are coming here next year, or over the next five years, or ever. Some newspapers have made bigger predictions. Last October the Daily Express ran the headline: ‘Now 29m Bulgarians and Romanians can soon move to Britain’. Other newspapers published similar stories. The entire population of Romania and Bulgaria is 29 million - it's impossible that they would all move to the UK, and such ridiculous proposals represent an affront to responsible journalism. All such headlines are misleading and have only furthered animosity and alarm towards immigration and immigrants. The reality is likely to be somewhat different to the hyperbole, which represents no more than guesses, without the backing of any methodology or evidence. There is no comparison to 2004, when only Britain, the Republic of Ireland and Sweden, opened their labour markets to Poland, Hungary, Slovakia and the other ‘A8’ countries, who were then joining the European Union. According to Migration Observatory, so far, Romanian-born emigrants have preferred Spain and Italy, and have been less likely to consider Britain. First, it is a myth that EU law gives all EU citizens an unconditional right to reside freely in the UK or another Member State. In reality, the right is subject to important restrictions. Second, it is a myth that EU laws means that EU migrants are automatically entitled to claim benefits in the UK or another Member State. It’s also an anti-EU fabrication that immigrants here who are entitled to benefits take excessive advantage of them. In February New Society magazine reported that there are ‘fewer than 7,000 Poles claiming the Job Seekers’ Allowance’. That’s a tiny fraction of the number of Poles now living in the UK and who are, actually, mostly in gainful employment. Indeed, academic research by a team of leading economists discovered that the ‘A8 immigrants’ – from Poland, Slovakia, Latvia, Hungary, Estonia, Czech Republic, etc – 'are about 60% less likely than natives to receive state benefits or tax credits, and to live in social housing'. So, there is no actual evidence that huge numbers of Romanians and Bulgarians are going to descend on the UK come 1st January 2014, or even that those who arrive will be automatically entitled to, or even inclined to, take advantage of our benefits system. Most of them will do what most Brits, Polish, German, French, Czech and other nationalities do - stay at home. Yet, in the absence of evidence, the comments by Mr Farage warning of enormous numbers of Romanians and Bulgarians moving to the UK seem only designed to promote anxiety and xenophobia, and to demean one of the primary principles and benefits of EU membership: the free movement of all EU citizens across all of the EU. Because, as it needs to be reminded again and again: it works both ways. As a benefit of EU citizenship, Britons are also allowed to live, work, study or retire in Bulgaria and Romania – and already an estimated 25,000 Brits do so. As the Romanian and Bulgarian economies grow, more British will be moving, working, sojourning and visiting there – and most importantly, many more British businesses will be taking advantages of their huge export potential. Already, almost 5,000 British businesses have established a presence in Romania, with our exports there now exceeding £1 billion. And many British businesses are now setting up in Bulgaria, including giants Glaxo Welcome and Tate and Lyle. This is all specifically facilitated through the direct benefits of our membership of the European Union. But that appears to be off-message according to the anti-EU agenda of Mr Farage and his UKIP party. Who do you think you are kidding, Mr Farage? Maybe Mr.Danzig should create his own party "anti ukip". Why don't we just come out of Europe, pay the fee to have its trade benefits and join the USA as a united state Britain? Because the United States Government has made it quite clear that they are NOT interested in that particular fantasy. Surprised that Mr Farage doesn't seem to have fully thought through the implications for EU resident British expatriates in defending his case for a British withdrawal. With more attention to the accuracy of his assertions which you show rather easy to disprove and a more compelling vision of what ideal world awaits the Uk outside the EU, perhaps he could count on more expat Brits voting "out" in an "In/Out" EU referendum (those still able to vote that is after less than 15 years non-resident in the UK)? If the majority of the British people wish to remain British and not join the United States of Europe (which is the aim of the EU) then who do you suggest they vote for? There is only one party that wants to maintain British sovereignty and that is the UKIP. I like being British and I will stand up against anyone who takes my country away from me without asking the permission of the people first. Would you be willing to accept a democratic vote if the majority want out? Being in the EU doesn't stop us being British, it doesn't stop our country being British and it doesn't take our country away from us. Being also British and comfortable with the concept of democracy of course I'd accept a democratic vote if the majority want out, even though as things stand being more than 15 years outside the Uk, and now living in France, I no longer retain that democratic right to vote in such a referendum. You will find that other EU nationals eg the French are equally as proud of their nationality and want to maintain their country's sovereignty but are more imaginative in taking benefit from membership of the EU. The latest polls in the UK by the way indicate that if certain powers can be renegotiated back to the UK, a majority would vote to remain "In" the EU and, in this event, I assume you would also democratically accept such a result. UKIP is not anti-EU. You cannot advocate capitalism and sovereignty. Capitalism cannot work within an existed territory. It needs to expand always. UKIP is a big contradiction. If you want to exit the EU vote for a left-wing party, but I am not sure that you don't have that in the UK. Well done Jon, we have seen plenty of anti EU rhetoric so it is good to see such an excellent article debunking the myths. For too many years now successive UK governments have blamed the EU for their own mismanagement of the UK economy and it is time that the truth be told. A very well thought out and correctly evidenced article and, as a retired police officer living in France for the past nine years, one I heartily recommend. I am one of the many who took up the option to move freely within Europe but this government now proposes to take that option away from me. I hope to see more of what you have published above instead of the hype being published by many of the UK newspapers that you mention. At least the Independent has published an open letter today from top UK business people that also supports all you say above. How do You find the french language? The European Union is, ultimately, run by Barroso and Van Rompuy. Perhaps you wouldn't mind telling us when and how they were elected and when they're up for re-election. And your assertion that Polish immigrants have "made a huge contribution to the British economy" does your credibility no favours. The EU is not run ‘run by’ José Manuel Barroso, the President of the European Commission. His role is to make proposals, based mostly on what EU leaders have collectively requested at summits. Then the elected European Parliament and our elected government representatives decide and vote. Neither is the EU ‘run by’ Herman Van Rompuy, the president of the Council of the European Union. He is chosen by a vote of the elected heads of state, and his job is to facilitate negotiations on the key issues and achieve agreement, with the main role of chairing summits. He does not have any power to pass laws. Both Barros and Van Rompuy have important but certainly not dominant roles. They were both nominated by 27 elected heads of government – so a clear mandate. Furthermore, the appointment of Barroso was endorsed by the democratically elected European Parliament: by 413 votes to 215 in 2004, and by 382 votes to 219 in 2009. As I explained in my blog, ‘The European Parliament is democratically elected and decides nearly all EU laws, and has the democratic power to dismiss the entire Commission of the European Union.’ That power includes the right to reject the President of the European Commission, who is beholden to the elected European Parliament. On Polish migrants, it is not an ‘assertion’, but clearly demonstrable, from Department of Work and Pension statistics, that Polish immigrants in the UK pay far more in taxes than they take out. They are far less likely to claim benefits than native Brits, as I also explained (with evidence) in my blog. Also numerous studies have shown that they have not ‘taken British people’s jobs’. Usually Polish, along with other EU migrants, have filled ‘pockets of labour shortages’, which can and do occur even during times of unemployment. I am Polish immigrant, I did move to UK in 2004 from Iceland, where I did reside for 6 years since 1998. Well well yes a country of UKIP examples - well you guys have no clue what you are talking about when you mention Iceland. In UK is controversial that short visiting foreigners need to pay if theyu go to see a doctor. In Iceland everybody pays, regardless of status - and yes we all paid taxes, insurances and so on. I had accident on cosntruction side - lot of scafolding has fall down on me and I was unable to work for 3 months due to back pains. icelandic government paid me for 3 months full salary until I was able to go back to work. In Britain after 3 years of bullying over the mobile phone I was drivven into depression - I took one month off- i received SSP and 117 pounds hosuing benefits - put, of which sum I did repay Reading Borough council 75 pounds. 1 month off for 9 years of work - and that happened because of my line manager bully in work place. I did admit A&E once after accident with the drill and had few stiches on my finger - thats about it. My regular working week is about 70 - 80 hours, including weekends, nights, bank holidays, exta call out duties etc etc etc. There are plenty of Poles like me living in UK - well then Mr.Anonymous - do we contribute to economy or are we a burden? Simple, they were selected by the Council (made up of ELECTED members) and then required a majority vote of approval by the democratically ELECTED Parliament. Can you tell me who voted for David Cameron as Prime Minister? No-one did. Nobody in this country has ever voted for a 'prime minister' they are selected by parliament based on a majority support... just like in the EU. So, what makes the EU any less democratic than Westminster?... in fact it is more democratic, as not only is the leader subject to a vote by the parliament, but the entire cabinet... whereas our cabinet is selected entirely by the PM, with no approval needed from our parliament. UK citizens living in Spain will have plenty of time to adopt Spanish nationality before Britain leaves(they are entitled to do so under EU law), and Britain recognises dual nationality, so they will not have any problems. Next! Wrong. UK citizens who have lived there for five years or more have the right to apply for citizenship. As for 'nest' there are a whole host of points above for you to consider. Spain will only grant you Spanish nationality if you first relinquish your UK nationality. There is no agreement on a "dual" citizenship. We in Spain are thinking of deporting all the British citizens who live here. We almost have 6 millions of unemployed. The last thing we want is the rich Northerners coming here making things worse, contributing zero with no working or paying taxes... deport them all. Yes they are immigrants. What were you thinking that Britain can easily kick EU citizens and there will be no reaction? No there will be no bilateral agreement with Spain about leaving British immigrants and kicking out EU citizens - EU will not let that happen, and government of Spain is with the club. Who will have to pay market prices for the houses of repatraited Poles? Taxpayer of course most likelly. UKIP policies are uthopy and bankrupcy for UK. The Spanish benefits system is pretty much zero. All lot of British people are drawing their pensions in Spain, selling their houses in the UK and taking that money and putting it in... Spain. Spain relies on tourism, which the British supply. The constant property selling and holiday deals are provided by the Spanish aimed at the British. Well that's pretty stupid considering they are bringing in money from the UK (pensions) while not taking any jobs that the spanish would want. British pensioners make substantial use of the Spanish health service and pension income is not usually very generous. On the other hand, citizens from other European countries in the UK are mostly fit, young, don't make much use of the UK health service and are mostly in full employment. In addition, UCL research calculated that in the past ten years, they have made a net fiscal contribution to the UK economy of about £22 billion. It should be noted, that there are more British people living in Spain than Polish people living in Britain. According to figures published this year, there are also more British people claiming unemployment benefit in Germany than Polish people claiming unemployment benefit in Britain. Hello Jon, I am an Spaniard living in Fuerteventura. So many Brits come to Spain to spend money as Poles go to the UK to take away as much as they can. The opposition to the EU in the UK is much to do with the real scroungers of foreigners and the taking-away of jobs. I propose that no foreigner should receive dole money or any kind of benefit, 2- that employers pay more taxes for employing foreigners. holyhoax, your comments don't match reality. In the UK, citizens from other EU countries working here make a considerable net contribution to UK funds. Rather than being a burden, they are a boon to our economy and are helping to pay off our national debt. I'm a British ex-pat in Barcelona. I'm fairly certain I have paid more tax to the government in the last year that the vast majority of the tattooed, long haired skateboarders know as 'Spanish young people'. And regrading the second comment, I'm aware that I'm an EX PAT. Not an immigrant, Google the difference. Besides which, as someone who has taken it upon themselves to try living in a different country, the little Englanders who vote UKIP look ridiculous and petty from over here. Anonymous (what a shame you couldn't have the courtesy and courage to post under your real name) I wonder why British people living in Spain are called expats but the Polish people living in Britain are called immigrants? Well Anonymous Ex Pat, have you integrated and learned either Spanish or Catalan? Having witnessed Nigel Farage belicosing in the European Parliament I find him to be crude, rude and socially indigestible. It is not Farage I fear, but rather those with a lemming like mentality who embrace his views. It is reminiscent of the ‘brown shirts’ who were also carried along with the tide. Unfortunately, I have already seen neo fascism at close hand in my own lifetime, when we slept night after night underground in our Metropolis. Farage is merely an offshoot of the BNP and those who would choose to follow him should wake up to what they are about.. The only issue where I share his opinion and that is where sadly the European Parliament although elected through the ballot box, unfortunately my experience when dealing at close hand with Brussels is where the unelected Commissions wield the real power with the Parliament paying lip service to them. Unfortunately one cannot even protest to the Committee on Petitions at the Parliament because they in turn rely on the advice of the Commissions who will not hesitate in deceiving them or the Parliament itself. Should anyone wish to challenge me then we have the documentary evidence, plus the jurisprudence of the Ct.JEU to substantiate what we say. The EU arose from the ashes of WWII, but as a pro Union citizen I do not like the direction it has taken over the years where it can now be likened to one enormous quango out of control. It is in urgent need of serious reforms, but that does not mean we should shoot the animal, but rather all Member States should make a concerted effort to bring about reform and to restore democracy in that place. At this moment in time The UK is being subjected to the I. Pavlov syndrome (conditioning) through our 2nd rate newspaper tabloids, who earn their living by preying on the weaknesses of the proletariat. David R. Burrage (you can Google me). EU Parlament? LOL. Come on. You can maybe vote them. But they no useful at all. The one's ruling aren't elected and the one elected have nothing to say in real big matters!! While Farage is not a lobbyist! You know that he is right-wing libertarian who wants cut-taxes for big businesses, so fat cats can earn as more as they want behind the backs of the hard-working people. I'm really sorry for this poor article of yours. We all know the EU is gathering all the legislative power from the nation-states. Every law approved at the parliament is mandatory for all countries. It's just a question of time before no country has laws of it's own. Being portuguese, I know that Mr. Barroso wasn't quite "elected" as president of the comission. Neither was Mr. Van Rompuy! They were placed there. The European parliament is allready working like the US congress. The game is rigged. In the front they all seem very honest and competent, but the reality is very diferent. I know this, lot's of europeans know this and YOU know this. If you’re suggesting that I would write something contrary to what I know and believe, you are most certainly wrong. Also, it’s not a good way to debate by making personal attacks. I only write what I believe and have researched. I have no reason at all to do otherwise. However, my mind is open to change upon receipt of evidence. As I explained in my blog, ‘The European Parliament is democratically elected and decides nearly all EU laws, and has the democratic power to dismiss the entire Commission of the European Union.’ That power includes the right to reject the President of the European Commission, Barroso. If you have alternative evidence, please provide it, I am keen to know, and actively welcome intelligent, respectful, well resourced comments and contributions. However, please have the conviction to post under your own name rather than anonymously. The source of information is important. Source: "While Parliament can change a law, it cannot start a new one, it has to ask the European Commission to do that." Also - you make the point that 75% of our laws are not created by the EU, but many can see that important areas of life and law which people are concerned about - like voting against Mass Immigration for example, are controlled by the EU, and they have no say. They have no say because the EU is a hierarchical structure, in which directives come from the top only. As I wrote in my blog, the European Parliament is democratically elected and decides nearly all EU laws, and has the democratic power to dismiss the entire Commission of the European Union. It also has the power to reject the budget of the Commission. Furthermore, the European Parliament has to approve the appointment of President of the Commission by a majority of MEPs. The Commissioners are chosen by the President from candidates put forward by the elected governments of the EU. The Commission presents proposed laws to Parliament, in much the same way that our government proposes laws to Parliament, for the members to discuss and vote upon. This is a form of democracy. I agree it’s not perfect, but surely better than our House of Lords. I would support initiatives to make the European Union more democratic. This, however, means staying a member of the EU and influencing its future, democratic, evolution. One new recent initiative is the ‘European Citizen’s Initiative’. This gives a right for European citizens to propose new laws to the Commission. This has to come from a million EU citizens from at least 7 of the 27 member states. Anonymous (again). The commission and commissioners play the same role in the EU as the cabinet and ministers do in Westminster, i.e. to propose policy and laws. In Westminster the PM selects the cabinet, we do not vote for them (I certainly would never have voted for Michael Gove to be education secretary). Nor do we get to vote for the PM... he is selected by those who we elect to the house of commons as our representatives. The commission president is also selected by our elected representatives, and so are the commissioners. At least in the EU the parliament gets to interrogate potential commissioners and vote on the whole commission and its president afterwards... there is no such oversight for the Westminster cabinet. Laws cannot be passed without the parliament voting in approval... in both cases. In both cases there are methods of parliament proposing laws, but in both cases it is usually harder for those laws to get passed. Also, as in Westminster MEP's sit on committees who actually help steer the creation of policy and proposed laws. That is an important role in any government. It's such a shame that UKIP MEP's rarely show up to any committee they are a part of... just another way they are letting us down and getting paid to not turn up to work. Like Peter I agree there is room for improvement in the EU democratic framework, but if we are going to criticise a lack of democracy, then we should be looking to lead by example and start with the worse democracy that is our own parliament, with it's unelected house of lords and the archaic and unrepresentative first past the post election system which distorts the real desires of the public for their representatives. What I find extremely annoying is the continuous misrepresentation and distortion of EU legislation. The laws aren't being "forced" upon us, they are passed through many checks and have been signed off many times by our elected representatives. First of all, the EU Commission has the prerogative to initiate legislation but only when it conforms to the principle of Subsidiarity. That is, it can only propose laws when it is clear that member states cannot do it on their own and can only be effective if done at a European level. If the parliaments or anyone else believes that this was not the case, the law can be challenged and rendered null. Secondly, the proposed legislation goes to the Council of Ministers and the European Parliament (if it concerns regular topics) where the process of co-decision happens. This is where both the Council of Ministers (which comprises of the relevant, elected government ministers of each member state) and the European Parliament (comprised of elected representatives of the people of the EU), both scrutinise the legislation, add amendments and then ultimately pass or block it. Therefore, each member state has many opportunities to scupper or amend a law before is passed as both the Council and Parliament have to agree on the same text. Each member state in the Council has its say and only rarely are any member states outvoted by the Qualified Majority Voting. Even then, they can call for an "Ioannina compromise" which compels the Council to acknowledge their disagreement with the majority ruling and try and find a compromise solution. Thirdly, many important competences such as Foreign Policy and Defence are governed strictly on an intergovernmental basis where unanimity is required and where every country has a veto so nothing in these areas are "forced" upon us. And finally, just a remark about the belief that Parliament does not represent the people or that it is powerless. The way I see things, it's powerlessness is due to a low turnout among voters who don't know what it does. In any situation, it is preferable to negotiate from more power from a position of strength. In a democracy, a clear position of strength is in high voter turn out. If voters don't bother to inform themselves about the Parliament, don't bother to express concerns to MEPs and don't bother to vote for them, why would anyone take them seriously and how would they ever become useful? You're then stuck in a self-perpetuating cycle where the most democratic institution of the EU sits there emasculated and then you harp on about the undemocratic nature of the EU. The idea just boggles my mind. Political apathy is democracy's worst enemy. That is what we should focus on and what we should combat, we need to get people out to vote and to re-invigorate this institution which could serve as a crucial component of the checks-and-balances of the EU. Have to take you up on that... the council of ministers does not really comprise of elected representatives, it consists of representatives who have been 'selected' by the heads of state, who in turn were usually 'selected' by elected representatives (depending on each country's democratic system). The UK arguably has a pretty poor link through to the people, but that is because the UK democratic system is so poor, and nothing to do with the EU. As a British pensioner who took up the right 8 years ago to move freely within the EU (permanently resident in France), please Jon could you tell me what I should do now? With the referendum now firmly fixed and the very real threat of Britain opting out, are there likely to be property price issues if we decide to move back to Britain, i.e. property price dives in France and property price increases in Britain leaving us high and dry? Should we move back now? I empathise with your situation. UKIP don’t have any policies, except leave EU. But then what? They don’t know. Ask them and see. Leaving the EU would be a leap in the dark, because nobody can say for sure what would happen and how it would work. No country has ever left the EU before. Voters prefer certainty, so I believe if there is a referendum, the British electorate will vote for the UK to stay in the EU. Usually people do vote to keep the status quo. That’s what happened at the first referendum on British membership back in the 1970s. Just before the vote, polls showed most voters wanted Britain to leave the Common Market (as it was called then). But when it came to it, the vote was 2-to-1 in favour of keeping our membership. A referendum on this issue is also not a certainty; it's not 'firmly fixed' as you wrote. If there is a referendum, it won’t be for at least another four or five years. A lot can happen in that time. If the economy of Europe significantly improves within that time, as I hope and anticipate, then the idea of having a referendum may lose appeal, along with the ideas of UKIP. If I were you, I wouldn't panic, and just continue to enjoy your rights as a Citizen of Europe, and retirement in France. What's the weather like? Immigration policies, giving benefits to foreigners or staying in the Schengen area are particular decisions of every country. The UK will continue to be flooded by foreigners and scroungers even if the leave the EU unless they take different measures. holyhoax, EU expats living in the UK come here to work and that's mostly what they do. We are not 'flooded by foreigners and scroungers'. I challenge you to provide evidence to support your notion. Three times the European Commission asked the British government for evidence of 'benefit tourism' and three times the British government failed to provide any. Unfortunately, you seem to be influenced by inaccurate xenophobic stories in some sections of the UK media. Your just as bad as the immigration will destroy the nation crowd. dressed up nicer clothing. 10k UK ppl live in Fethiye in Turkey alone. Does not being in the UK present a problem for UK expats there? A few inconveniences but no. My Grandparents moved to Tenerife well before EU joined the EU or the single market. what are u suggesting the EU nations will ethnically cleanse the EUro sceptic Brits? And no the economies of EUro land are not going to recover. They dont have the demographic profile to recover. Italy has not registered any growth this century. I could not possibly propose that EU sceptics should be ‘ethnically cleansed’. In a modern, democratic society your opinion is as important as anyone else’s, and deserves to be listened to carefully and politely. Without pro and anti EU supporters, there would be no debate. And we need a good, open debate to fully understand the issues and make up our minds. I acknowledge this is how you feel, and there is no point arguing with someone’s feelings. Regarding facts, figures and evidence, however, they can be challenged, and should be. If you have evidence that any factual content I have presented is incorrect, please tell me, and present it here, with empirically sourced material. It’s vital that we are led by evidence, rather than emotions, as the result of any referendum, if there is one, could affect the country for a long time. It seems you are suggesting that, if we leave the European Union, other countries should still accept British immigrants to their lands, but we should not accept foreign immigrants to ours. This seems to me to be a double standard. Why should we, and other countries, benefit from our emigration to them, whilst disallowing the benefits of immigration to Britain? Finally, I would urge both sides of this debate not to make personal attacks: it simply isn't the way to win hearts and minds. Neither side can afford to be so complacent as to think they already have sufficient votes to decisively win a referendum. In our democracy, all we have is the power of persuasion, and it is far more effective to attack people’s arguments than to attack them personally. We need this to be civil; not a civil war. The loss of EU membership will have no bearing on Britons living in Europe. I have lived in the Philippines for three years. There are are thousands of Brits here. We are welcome because we bring currency and investment into this country, boosting the economy and providing jobs! Also, of course we get no welfare benefits either so the Philippines has nothing to lose by our presence and everything to gain! Do you really think Spain would want to risk 500,000 extra properties coming onto the market simultaneously in the event they were to force the Brits to leave, let alone the the fall in revenues from their spending? It’s interesting, but in my view illogical, that some people think British immigration to other countries benefits those countries and the British expats, whereas immigration to Britain is unacceptable and not beneficial. There is considerable evidence that immigration has generally benefitted the UK economy. As we have seen from the statistics, with about two million Brits already living in other parts of the EU, and millions of other Brits living in other parts of the world, the free movement of people is generally a good thing for both host and guest. Of course British people went to live in other parts of Europe before our membership, but the EU has made the process so much easier. No one can say for sure what the attitude of host EU countries will be to British expats should we leave the EU. Attitudes may change if we say EU migrants are not welcome in the UK, whilst still expecting British expats to be welcome in other parts of Europe. "It seems you are suggesting that, if we leave the European Union, other countries should still accept British immigrants to their lands, but we should not accept foreign immigrants to ours. This seems to me to be a double standard. Why should we, and other countries, benefit from our emigration to them, whilst disallowing the benefits of immigration to Britain?" No country would agree on that. I am surprised that some British people are so naive. It just won't happen. We are out - you are out. Did Farage really say that? I like the words Simon Cowell often say to really bad contestants, "There is a difference between being confident and being delusional." It appears to me that Farage and his henchmen are extreme right-wing reactionaries who get their support by peddling totally false populist propaganda, which is basically rabble-rousing nonsense. An unpleasant character, please continue to expose his lies. It's worse. It's scapegoating. Telling people that our difficult problems and all that is wrong in this country is the fault of people who were not born here. This not only creates prejudice and fear, but also distracts us from the very real problems we face and looking at what actions really will start to address them. It's easy, when times are hard, to comfort people by giving them an easy explanation and target for their problems, but it isn't right. When we leave the EU and nothing gets better, who then will they turn their ire on? It is interesting that Farage describes the EU as undemocratic. Personally, myself and my family and all our friends always vote for our MEPs, but on the other hand I have absolutely no say whatever in that totally undemocratic, home-grown law-making body the House of so-called Lords. >British immigrants to their lands, but we should not accept foreign immigrants to ours< Where did I say that. You set up a straw man and pretend to knock it down. It will of course all depend on economics. Economics is never a zero sum game. UK expat communities have always been welcomed, I am pretty sure Spain will not want a big chunk of ppl to up sticks and walk away. UK at 80M plus midC is going to be the biggest market in Europe if not the EU. We can deal with trade issues 2 ways either unilateral free trade (pref option) or a reflective trade policy (our rules to your goods are the same as our goods to your rules) Trade is not a problem it will continue and so will the flow of ppl. If a nation is stupid enough to subsides goods and send them to us, thats the same as sending us free money. I will take it. I could not quite understand your posting, which is why I wrote, ‘It seems you are suggesting..’ That was in response to you writing, ‘the immigration will destroy the nation’ but also adding that UK people live in Turkey and your grandparents moved to Tenerife. You argued that UK expats are welcome in other countries and both sides benefit; I argue the same is true of Polish and other expats living in the UK. They are welcome, have enriched our society, and we have both benefitted. We can agree to disagree, but I am willing to listen to your arguments, and I hope others will too. However, I believe that staying in the European Union provides us with special access to the world’s richest trading area on terms we could never match completely outside of the EU. Even Norway and Switzerland have to accept EU rules, and contribute heavily to the EU budget, for the privilege of trading access to the EU market. But as non-members, they don’t have any say in the future of the EU or any vote in the European Parliament. I don’t think that’s good enough for the UK. Furthermore, through the EU, we have preferential trading agreements with countries like China, USA, Brazil, etc. I don’t think there’s any evidence we could negotiate such similar advantageous trading arrangements with those and all the world’s other countries on our own, as a small island, without the powerful benefit and leverage of being a member of the EU. Unfortunately, we only have evidence of what things have been like as a nation since we joined the European Economic Community in 1973. You or I cannot provide evidence of what things would have been like if we had not joined. So, you may be asking people to take a big leap of faith to vote us out of the European Union, without really knowing how we would fare or what life would be like. Eurosceptics have a considerable burden of proof to demonstrate that life would be much better on our own, outside of the European Union. In my lifetime, since we have been members of the European Union, I have seen the nation’s general standard of living considerably improve. Back in the 1970s this country was considerably poorer. I know we have a huge debt mountain, and I know we have too many unemployed and people who are unfairly struggling and poor. Yet, despite that, as a nation, our population as a whole has never known any time in history when we’ve generally had a better standard of living, been healthier, more educated, or lived longer. You say the standard of living has improved under the EU, but thats not so - the EU policy of MASS immigration has seen steep declines in purchasing power for working incomes. Can a working man buy a home today like my father did on 3 times earnings? No. There are 5000 people arriveing to settle in the UK but only 200 homes built per week. Employment for native Brits has went DOWN over the years of EU MASS immigration. Wages as part of national income (GDP/GDI) are the lowest in history, while profits and rents are the highest. I see the 'argument' that we should have a points based immigration system like Australia has been raised once again. Strange really as the current UK points based immigrtation system introduced by the last labour government was modelled directly on the Australian one. We don't need to adopt the Austraian system as we already have. Interestingly the 2011 Australian census showed that more than a quarter of Australian citizens were born abroad, a third had both parent born abroad and more than half had one parent born abroad. If that is the kind of immgration figures UKIP has in mind for the UK I do think we should be told. This needs to be put into a global perspective. According to www.GlobalRichList.com, if you earn the UK’s average income of £26,500 you’re in the top 0.64% of world’s richest people by income. If you have £25,000 of assets, you’re in the top 18% of the world’s richest people. The UK is the seventh largest economy in the world. Can we name a time in history when the general population had a higher standard of living, was more educated, healthier or lived longer than now? I agree that this is hardly any comfort if you’re unemployed and poor in the UK. But for most of the population, living in the UK represents undreamed of luxury compared to most others on the planet. Housing is an anomaly. It is far too hard to buy a house nowadays, but even with that taken in to account the vast majority of people in this country enjoy an amount of living space per person that greatly exceeds that of previous generations, and despite the depressing and pressing issue of homelessness, this has seen a sharp decline as the prosperity of the country has allowed us to do something about it. Can you tell me any point in our history where the vast majority of people have been able to own quite so much, or have such variety and choice over what they purchase, where so much is so readily available on the high street and via. online retailing? All of this has benefited greatly from free trade within the EU and from the free trade agreements of the EU with other countries; also from the standardisation of standards, and the sharing of ideas and ventures cross-nationally (often led by the UK consultancy and design sector which is seen as one of the most important international players in the market, often, in certain disciplines rivalling that of the USA). The ability to allow our businesses to work internationally within the EU has allowed our influence to spread much faster and further than we could have managed if we were constrained by cross-border restrictions. The issue around the points based Australian like system of immigration is an example of the argument where people are talking past each other. For the Pro-Europeans the debate is around immigration from outside the EU and that system is already in place and has been for several years. For the anti-European they want to stop immigration from France and Spain never mind Poland or Bulgaria the point based system is an irrelevance in that context free movement applies. For those who have emigrated to Phillipines or Thailand good luck to you but at the same time there is a difference with those who have emigrated within the EU. Within the EU you have to be treated as if you are a citizen of the host nation, once the UK is outside it presumably the Spanish will not overnight round up all the British passport holders but gradually the young people getting jobs pulling pints on the bars and clubs will lose their jobs as those jobs will have to go to Spaniards or Dutch or Germans, then for the retired residents access to Spanish hospitals or healthcare will see additional charges. If you are a business owner providing lots of spanish jobs you may be the last to be impacted, but most British residents in Spain are not that. Really great material Jon, congratulations. I am proud to call myself a citizen of Europe and of everything that comes with this. We need to do more to make people aware in the UK that they ar citizens of Europe as well as British citizens. If people want to attack this concept of EU citizenship, in my view they are simply helping us to make the case by giving us the opportunity to have the debate. Yes, a very, very good blog - providing actual facts. Unfortunately, most anti-EU people aren't interested in facts. Their views come from ignorance and fear, and is fuelled by the xenophobic parts of the British press. I will try to send other people to this page. Great blog, and I like your other one "EU ROPE" too. However, this whole issue is not so clear cut - and immigration or the EU may not be the targets of those driving the discussion. What comes out of the immigrants issue? That there is a problem with the benefits system. Logic might suggest fixing the welfare system is the most practical thing that can be done. So, downsize welfare (50% of Government spending), and you downsize government spending and you downsize the size of Government itself. The fact that British trade and the economy would suffer is irrelevant to the Plutocracy, for whom power itself seem the aim. Now who do we know have a semi-religious fervour to reduce the size of Government? The methods used are much the same on both sides of the Atlantic, with the Tea Party on one side, and other aggressors over here. Control the press, fund politicians and political parties, train or pay aggressive interlocutors, lobby, drive the agenda, pull the levers of power. So, of course the EU becomes a target - even the plutocrats don't have enough money to control it. It doesn't matter how you try and spin it, the fact is for 3 decades the UK population was stable at 58 million and now it suddenly jumps to 65 million. You may say that these immigrants are not a drain on the system but the fact is we did not have a deficit before they appeared and now we have a huge £100+ billion deficit every year. We are not getting enough tax back from these migrants to pay for all the benefits they are receiving and there is no amount of realistic growth that is going to make up that deficit. The only way we can make this work is by getting our population back in line with what this small island can actually support. The only way we can do that is to leave the EU, its as simply as that. On the economic front, we make a loss from being in the EU on every single metric. Currently we are paying them £10+ billion every year so that they can sell their luxury cars over here duty free. Yes some British companies do export to the EU but our trade deficit with it is absolutely huge. On the other hand, our trade with the rest of the world is in surplus, so the idea that the EU is necessary for our economic health is just a complete load of tosh. Lastly if we take back all the 2 million Brits resident and working in the EU, it is a price worth paying for being able to rid ourselves of the 10+million recent migrants that has come to the UK. At the end of the day, we just can not support this population, we do not and never will have the resources. Anonymous, it's a shame you are not prepared to post openly under your own nae. I feel that always weakens someone's arguments. The evidence doesn't back up your assertions. The EU migrants here are paying substantially more to the British government than they receive in benefits. In any event, few of them are on benefits; most of them come here to work and that's what they do. There is no evidence of a serious problem of 'benefit tourism' - if you have such evidence, please share it here, with a reliable, verifiable source. The British government was asked three times by the European Commission to provide evidence of so-called 'benefit tourism' and three times the British government wasn't able to produce any. 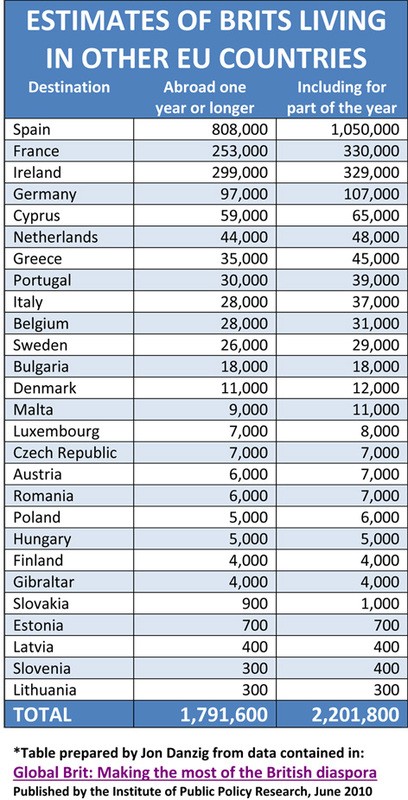 Research from UCL has demonstrated that in the past ten years, migrants here from other EU member states have made a net contribution to government funds of about £22 billion. That's more than native Britons, who in the same period have been paying less in tax than they receive in benefits. So, these migrants from the EU are actually helping to pay off our national debt; they most certainly didn't create it. Few were complaining about Polish people and others from Eastern Europe when they first came in 2004; serving them coffee, decorating their houses and caring for their elderly relatives in care homes. It was only after the 2008 world wide economic crash that people wanted to scapegoat them. I don't know where you get the 10 million immigrants figure from. The number of citizens from other EU states in the UK is about 2.3 million - pretty well matched by the number of Britons in living in other EU states. I am not a UKIP supporter, I am an ordinary member of the public. Actually, I am an engineer and one thing I am damn good at is interpreting statistics. Unfortunately the professors that compiled that report are not so good at interpreting, either that or they are deliberately intending to mislead, I tend to think the latter is more probable. So, the UCL report raw data proves exactly the opposite to what you say. Look at graph 1a at the end of the report, its shows conclusively that immigrants are currently a net drain on the economy and have been for the past five years. It also show that before the larger scale immigration occurred when Labour came to power in 1997, the native population were net contributors into the system. Keep looking at that graph around that time and you will notice that as time progresses and more immigrants arrive, the native populations contribution declines and the migrants increases. What that data is showing you is that immigration is driving the native population into poverty and by the end of the time line, so many have arrived that they have driven themselves into poverty as well. ‘Our graph 1a clearly shows that before 1997 the net fiscal contribution of natives was negative, it then becomes positive in 1997 and until 2000, when it starts declining. At the same time, EEA immigrants make consistently positive net fiscal contributions throughout except before 1997 and in two recent recession years. Note that during the recession the net fiscal contributions of natives worsen considerably, while those of EEA immigrants are only slightly negative in two years. ‘In our study we compute the net fiscal contributions of immigrants and natives in every fiscal year in which we observe them. We do not make predictions about their fiscal net contributions in the future, as any such exercise will have to rely on very assumptions. ‘The point on infrastructure is mere speculation: there is no firm data on the cost of providing services like education to immigrants, so a reasonable assumption is to assume that they cost as much as natives (possibly less, as the marginal cost of providing education may well be below the average cost). Note also that our data do not allow us to identify adult second generation immigrants, so we allocate to immigrants the cost of educating their children, but when these children are adults, work and pay taxes we allocate their positive contributions to natives. They are fudging the data, the graph is clear and its backed up by data from HMRC, there are exactly the same number of tax paying adults in the UK in 2013/14 as there were in 2000/01. It doesn't matter if the immigrants are contributing or not, if they have replaced a native rather than supplemented them then the net effect is the same, that the immigration will cause a deficit. It costs £50bn to support that additional population and we are not getting the tax returns from them to pay for their upkeep, the numbers don't lie and there is no way you can spin it any other way. Where do you obtain data that it costs £50b to support migrants and that we are not getting the tax returns from them to pay for their upkeep? This does not support the findings of recent research that found that, on the contrary, in the past ten years EEA immigrants contributed 34% more to the fiscal system than they took out. Regarding EU migration/immigration it is actually remarkably well balanced. There are about 2.3 million citizens in the UK from other EU countries, and about 2.2 million Britons living in other countries of the EU. So if all EU migrants here went home, and all Britons living in other EU countries came home, the population of the UK would be the same as it is now. There is no evidence of so-called ‘benefit tourism’ being an issue. Three times the European Commission asked the British government for evidence of ‘benefit tourism’ and three times the government failed to provide any. The fact is that people come and go for jobs: no jobs, no movement. Migrants do not come here for benefits, they come here to work. The free movement of people across our continent enriches societies more than the financial contributions that they make to their host nations. I enjoy living in a cosmopolitan country with a diverse mixture of people. Clearly, you feel differently. What's new? The major victory parade after WW2 that was held in London had troops from all over the world fighting for the allied forces BUT THE POLISH. The fought hard everywhere with the British forces, made legend with Monte Casino. After the war they were simply sold to the soviet and the former officers of the Polish free army shamefuly became dead weight for the British society. I believe that the Middle East permanent crisis in the latest century is also the result of the "respect" that British politicians show to other nations. I have a low estime for journalists (in my country especialy but also for those like in "Daily F(m)ail" but you seem to do a honest and well done job in this field. Keep up! What position of the BBC are you referring to, Mr/Ms Anonymous? I wonder what anti-EU think would happen if we left. We no longer have an empire so how would we stand as a small nation with no trading agreements? Obama has stated he would not be happy to trade with us if we were out of the EU. The EU is the largest economic unit in the world. Will any country want to invest in us, put their bank HQs in London if we go it alone. Chances are they would leave & go to Singapore and London economy would collapse. London has sucked up so much funding from the rest of the country that we have very little manufacturing. If it wasn't for EU funding to areas in North we'd be even worse. First there was the Rome Treaty the progeny of the Coal and Steel "Union" of the German and French .The British were affronted by the fact that France ,Germany and Italy could move without the direct authorization of the Great British Empire. Then in all its arrogance and in the failed belief that they were still Great and being totally peeved went and formed their own club EFTA (European Free Trade Agreement) where Britain could Rule the Europeans -note that Britain has never considered itself European- but the club failed economically because it only had countries with little or no economic clout. Then Mac Millan went cap in hand to the by then EEC or Common Market and asked to ingress. DeGaulle refused because it would mean letting in the USA through the back door due to the closeness of the UK and USA. He came away crying (according to DeGaulle). We finally joined and since then have winged and complained about lost sovereignty etc.etc. However for all the griping we have never been so well off and never made so much money from exports and services as since we joined. The recent debacle of the US bankers Lehman Bros caused an economic recession which is still with us. Margaret Thatcher created the City in its present form and failed (as Labour and now Conservatives) to put enough legal restrictions on Bankers and others . The EU is guilty of allowing Southern European countries which did not have enough economic strength to be in Europe. Suddenly these countries had access to ECB (European Central Bank) money at 3% . The countries imported and borrowed without restrictions and luxury goods were imported mainly from Germany i.e. Porche Cayennes to middle class Greeks and others who could not afford them. Of course if we are to get out then before I do so I want to know Mr.Farage where am I going to sell 40% of our exports to?.And don't come up with bull s....t tell me exactly how much and to whom not pie in the sky. By the way Norway is a major oil producer with a small population and Switzerland lives off tourism,cheese,swatches and money from drug barons,mafia , dictators pension funds etc. In the Second World War they funded Hitler's re-armament so they are in on every shady deal. Mr Farage you are a Fascist that has lived off the EU for 15 years and has done a pretty lousy job defending our interests and now like some lowly BNP acolyte you pretend to be a patriot. Do you know why you are a dangerous Fascist because you admire murderous criminal Fascists like Putin and Assad no doubt Mugabe and perhaps even Il Duce and Adolph Hitler. Maggie also didn't like foreigners. I only hope that next time you have an accident when they take you to hospital the "foreigners" in there refuse to treat you and your family have to take you to a "all white blond blue eyed staffed " hospital.Who knows perhaps in Norway. By the way where does the Farage name come from ? Don't tell me you're descendant of the French ? I read that Mr. Farage was shocked when he went on the train and several stops without hearing English being spoken...poor Farage. Well Mr.Farage you ought to take your holidays in Albufeira that's in the Algarve,Portugal...where you will have to speak English to be served at a myriad of restaurants bars and cafes ...not only is the place over-crowded with British Citizens but also the businesses are nearly all British.Spain is even worse. The fact is the British refuse to integrate in all the European countries they live in and in fact disrespect the host nations citizens and act with arrogance as if the British Empire still existed. If it happened in Southend or Skegness the locals would have set their places on fire and hounded them out of town. I prefer the "honesty" of the BNP who are racist and make no bones about it. I am a brit living in france , and europe has been good to me , I left britain during the thatcher years because i could never ever ever ever buy a home in britain , and never ever will be able to , I am fully in the sysatem and i have worked in france , but recently with the years I now claim handicapped benefit in france, I am very fortunate that france helps me so , i doubt that britain with it's present system would , although i have been in france now for 22 years , I don't have the right to vote in the presidentials , I can't vote in britain either because I am so long away now that I have no idea where I was last registered to vote .What a strange situation .I doubt if i could get french naturalization because I am no longer in full employment and that is one of their primary reasons for refusal . The EU has been good to me and I dread , yes really DREAD the consequences of britain pulling out , I would be alone and homeless . British People go to Spain and Spend their Private and British Pensions over there, they would not be "Kicked out" if we left the Eu their Money is Liked. People come here from the Poor Countries of Eastern Europe e.g. Poland,Romania, Bulgaria, Turkey (next), Ukraine? (when does it stop?) and don't claim Benefits but take Jobs and drive down Wages that could be done by "the Locals" e.g. (1 Million Young Unemployed). It costs the Spanish government £249 million a year to provide health care to the Britons who live in Spain (after insurance and UK charges). Many Britons living in Spain are pensioners and not actively contributing to the Spanish economy. On the contrary, immigrants to the UK from other parts of Europe in the last decade made a net fiscal contribution to the UK of around £22 billion. Most immigrants to the UK from the rest of Europe are in gainful employment and make a substantial net contribution to our economy. 1) A lot of Brits come back to the Uk for their Operations. 2) They ARE Actively contributing to the Spanish economy, they are Spending their BRITISH Private and State Pensions over there and not Taking Money out of the Country i.e (sending it back) 3) They might be in Gainful Employment but if so why do we have we 1 Million Young Local Unemployed here, why aren't they in gainful employment? 4) What about when Turkey, Ukraine Join Jon? The More the Merrier? It's a Small Island Jon. It works both ways; British people have the entire market of Europe to seek jobs. If we retreat, seal our borders, and become just a little island, alone and out at sea, we will not thrive; the country will be in decline and considerably poorer. When was Britain last alone as a tiny island? We used to have an Empire as our Single Market; we cannot go back to that. The European Union is now our single market and we need to be part of the world's most successful and biggest economy to do well in the world. On our own, we simply don't have the same huge reach and muscle as the EU to negotiate the world's best trade deals and agreements. If all the citizens from the rest of Europe now living in the UK went back home, and all the Britons living in other parts of Europe came back home, the population of the UK would be the same as it is now. And what would that achieve? Nothing but huge and unnecessary disruption. Why don't you have the courage of your convictions and post your comments under your own name rather than as 'anonymous'? Anonymous ---> I am spanish and i am telling you, you are brainwashed. Houseprices because of brits went DRAMATICALLY up. A huge queues in hospitals and huge inflation. The other problem is fact that they usually buy foreign products so there is no support for domestic economy. The idea of reciprocal deals with certain EU Member States, but not others, is problematic legally and politically. Legally since there is some internal harmonisation on immigration law, the EU, not its Member States, has external competence over at least some aspects of immigration law. Politically, why would countries like Spain do a deal with the UK, if there are more British nationals in Spain than vice versa, and when the Spanish would be angry (among other things) about loss of fishing rights in UK waters? Hi. I would like to add to this discussion another point - in a year 2004 and 2005 Germany has been losing 500 workplaces A DAY because their companies moved their factories to Eastern Europe and it was exactly the same in France or Nederlands. It is more than obvious that most companies will consider moving their factories somewhere else if UK will leave EU: http://www.theguardian.com/business/2013/nov/08/nissan-automotive-industry. Many companies have stayed in the UK because they knew a very cheap and hardworking peoples are coming. Jon you forgot to add that every single EU citizen is allowed to live and work in every EEA country as well as in Switzerland. If Britain will start to trade with EU like Switzerland you will not be able to stop immigration from EU. I would like to remind all of you that EU is not a free buffet.China, US, India or Brazil - they don't care about Britain, they only care about biggest economy in the world - EU. Dear Mr Anonymous, thank you for your comment and question. Last year, more British people claimed unemployment benefit in Germany than Polish people were claiming unemployment benefit in the UK. 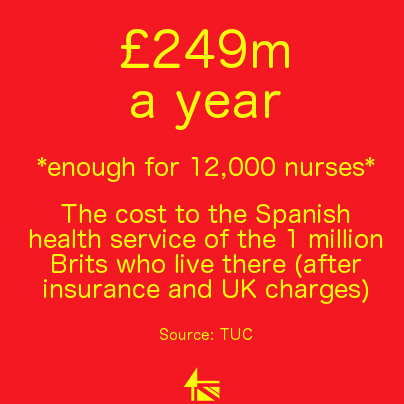 Each year, the Spanish health service spends £249m on health care for the one million Britons who live there (after insurance and UK charges). More British people make use of the right of free movement across our continent than any other EU nationality. With regard to the citizens from other EU countries living in the UK, very few of them claim social housing and employment benefits such as working tax credits. EU citizens here from East and Central Europe are around 60% less likely than British natives to receive state benefits, or tax credits, or to live in social housing. Furthermore, those EU immigrants pay almost 40% more in direct or indirect taxes than they receive in public goods and services. Almost 94 per cent of the working-age EU immigrant population are not claiming working-age benefits. They contributed about a third more in taxes than they received in benefits. According to research by University College London, citizens residing in the UK from other parts of Europe in the last decade made a net fiscal contribution to the UK of about £22 billion. Most immigrants here from the rest of Europe are in gainful employment and make a substantial net contribution to our economy. With regard to war, no countries during their membership of the European Union have warred with one another. Through the European Union, we've found peace. That’s quite an achievement, I believe, when one considers that the planet’s only, and hopefully last, two world wars originated right here, in Europe. My vote is for Britain's continued membership of the EU. According to The Spectator magazine, fewer than 7,000 Poles were seeking Job Seekers Allowance. Obviously these figures are in a state of flux, and never fixed. They are changing all the time. With regard to foreign prisoners in our jails, your statistics are way off the mark. At 30 June 2013 there were 10,786 foreign nationals in prisons in England and Wales from 160 different countries. Poland, Jamaica and the Irish Republic are the countries with the most nationals in prison establishments. The proportion of foreign national prisoners in the prison population is around 13%. Your claim that less than 375,000 Britons are working in other EU member states is also wide of the mark. Compared to the 2.3 million EU citizens in the UK, which includes people who came after Poland and nine other states joined the Union in 2004, British consular authorities estimate that 2.2 million Britons live in the other 26 EU countries, excluding Croatia, which joined in 2013. The UK government has stated that the real numbers could be higher, due to “a high evidence of non-registration” in France, Portugal and Spain. Of the total, some 400,000 are British pensioners. I am prepared to publish more of your comments here, but only if you have the courtesy and courage to post under your verifiable real name rather than anonymously. Dear Mr Anonymous, you have attempted to post another comment here that is nasty and a classic 'ad hominem' approach that I simply do not permit on my blog comments section. You wrote in addition to other unfounded allegations against me that I am an "enemy to this country and one day i hopd to see you and your kind pay for your crimes" etc. This of course is defamatory and I note that you still do not have the courage to post under your real and verifiable name. Subsequently your comment has been deleted and will not be published here. You asked if I had a Wiki entry and if I requested for such an entry to be removed. I can confirm that I have never had a Wiki entry about me and therefore I could not have ever requested its removal. I suggest now that you go and infiltrate someone else's blog; you are not welcome here. As a british citizen living in germany i have had to claim Unemployment benefit too. (and got retrained at a HUGE cost to the german taxpayer) but these EU workers have also paided NI and taxes too. If you have paid into the system you as entitled to claim benefits like anyone who has pain ad a UK National. Worst in this debate for me is Irish and Commonwealth citizens are allowed to vote 1.5 million expats ARENT! This vote effects me just as much as anyone living in the UK. magine being forced to leave your job and home. The first thing id have to do is CLAIM UK benefits because im unemployed. Is that in the intrest of the UK too? Reading this in Sept 2014 what a bag of tosh you wrote. We now have IS; french ports over over run. Eu reps being voted in by the back door with no say given to any of the people in the Eu states;Scots trying to split from the UK.What a lovely EU we live in. I agree that Mr Farage was wrong in some of the things he said . Things are much worse than any one could have ever thought. What has EU migration to do with French ports being "over run"? All EU citizens - including Britons - can travel freely across our continent using legitimate means of transport. What exactly was "tosh" in my challenge of the statements made by Nigel Farage? In times of international crisis, I feel safer for Britain to be part of the European Union rather than on our own. My wife & I are pensioners living in Spain. I thank you for your blog & reply to questions & feel much more reassured of our continuing comfort in Spain into the future. However, I am disturbed by the prospect of free health care being withdrawn if Britain were to leave the EU. I have also heard that state pension would be frozen as in Canada, Australia etc. though this is of much less concern due to the pitiful annual increases we get. Can you offer me any further reassurances on these points? Dear Anonymous, thank you for your comment, although I am unsure I've been able to offer any reassurance about Britain's future in the EU - but I hope readers may be better informed on the good reasons why the UK should stay a member. I can't offer information or reassurances, unfortunately, regarding state pensions for Britons abroad. I am not in government and we are about to have a General Election. I suggest that we should scrutinise the manifestos of the parties when they are published in due course. Will you be able to vote in the UK's General Election? Hi, I just wanted to make a correction - Victor Ponta is NOT the President of Romania (thank the lord! ), and neither was he at the time when he gave the 2013 interview you mention. He is the Prime Minister. The EU does not confer the rights of freedom of movement of people nor the rights to take their pensions or health benefits with them. These rights are conferred by the membership of the EEA, which includes non EU countries. So UK leaving EU would not have the effects that the don't leave thhe EU scaremongers want us to believe. Further, if UK left the EU AND the EEA, the expats who have lived abroad for more than 3 yrs (and the actual act of leaving would likely take at least 3 yrs to happen) get to keep all their rights in their new country of residence under the treaty of Rome. In summary, leaving the EU (and/or EEA) would make bugger all difference to everyone, except the UK taxpayer who would save a huge expense, and the EU gravy train parasites, who would lose some of their free money. “As a matter of EU law, the rights of EU citizens within the EU are conferred by the EU Treaties and EU legislation, not the EEA. The EEA merely extends those rights to Norway, Iceland and Liechtenstein. “National legislation in the UK and elsewhere may refer to the EEA more generally but there is a distinction when it comes to the source of those rights. “If the UK leaves the EU it could remain a member of the EEA if it joined EFTA; that would depend on the willingness of EFTA members to accept us and the UK's willingness to join. It is not clear that the UK would seek to join since this would keep free movement of persons with the EU in place - the very thing that many on the Leave side highly dislike. I would add that the British prime minster, David Cameron, said in Parliament today (in response to a question on what would happen to British citizens living in the rest of Europe if we left the EU) that there is no certainty on what their status would be. It would be complicated and open to negotiation. The issue is certainly not covered by the Treaty of Rome. The former attorney general, Dominic Grieve, claimed that British citizens living in the rest of the EU would become 'illegal immigrants' if Britain left the EU. I am not sure that's correct, but the point is that nobody knows. It would be a walk into the dark, as Mr Cameron has warned us several times. The EU brings in much more than it costs us. Why would 27 other members of the EU, plus the EEA countries, agree to the rules and costs of the EU, if the costs outweighed the benefits? We are the only country having a referendum on whether to leave the EU, and not even EEA countries such as Norway or Iceland are wanting to abandon their commitments to EU rules and contributions. Thank you for your comment. It will be posted once moderated. © Jon Danzig 2012 - 2016. Theme images by enot-poloskun. Powered by Blogger.